Is SETI Morphing Its Mission? Look at the mission statement at the website of the SETI Institute: “The mission of the SETI Institute is to explore, understand and explain the origin, nature, and prevalence of life in the universe.” What happened to the aliens? The word “intelligence” is not found in their mission statement. It sounds indistinguishable from the mission of Astrobiology (which does not care whether the life is intelligent). A look at the dozen activity boxes on the home page only reveals two or three that seem clearly relevant to the Search for Extraterrestrial Intelligence. Further indications that the SETI Institute is morphing its mission into a bigger tent can be seen in the News links: a report on the Leonid meteor shower (this is about planetary science, not SETI); an interview about the ethics of space exploration (that’s human space exploration, not Star Wars); an interview with a young scientist studying extremophiles in salt ponds on earth (that’s regular biology); and an airship-based investigation of climate change (that’s political science – 11/26/2009). Only at the bottom of the column is there one clear article about SETI. For some reason, Space.com dropped its link to weekly news articles from the SETI Institute. These used to be clearly noted on the top title bar. “SETI Thursday” is gone. The last two articles did not deal with SETI: Sept. 2009 dealt with the institute’s “Adopt a Scientist” program, and Oct. 2009 was a review of the movie 2012.. The link Space.com/SETI only lists previous articles. The SETI project has long been lampooned in some quarters (notably the Senate; 04/17/2006 and 11/18/2005 commentaries) but supported with almost religious fervor in others (09/24/2005, 06/03/2006). Carl Sagan used to promote the search as the noblest ambition of the human species. It’s not clear why Space.com and the SETI Institute appear to be downplaying SETI at this time. Who knows; perhaps the economy has affected funding and, like a private company, they feel the need to diversify. Perhaps Paul Allen is re-evaluating his charitable contributions (10/12/2007). Perhaps the public is losing interest in SETI after 50 years of failure to find anybody out there. 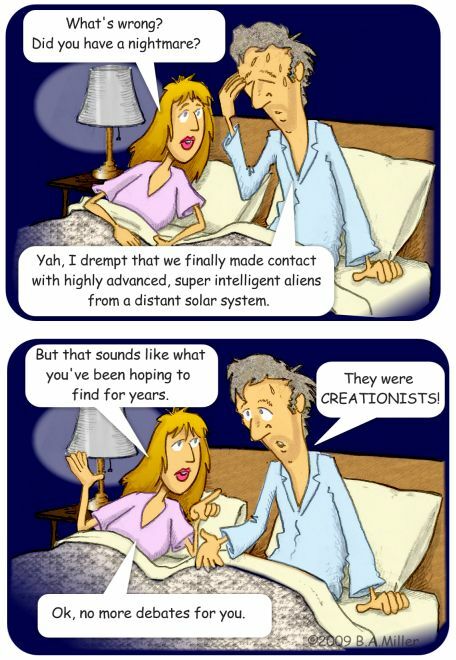 Or perhaps SETI advocates are smarting from accusations that they are using intelligent-design methods inconsistent with their Darwinian world view (see 12/03/2005 and this Brett Miller cartoon). Astrobiology is a bigger, warmer tent. The life can be microbes on planet Xircon Z589 and an astrobiologist will be happy. That was not, however, the mission of SETI. Jimmy Carter wrote on the Voyager record that “We hope, someday, having solved the problems we face, to join a community of galactic civilizations.” SETI scientists don’t want to join a community of slime (do they? ); they want to talk with sentient beings like ourselves. Has SETI become impolitic again? For the time being, discretion seems to be calling the SETI Institute to de-emphasize its raison d’etre and pretend to be regular scientists – studying earth life, meteors, climate, extrasolar planets, and normal astronomy. If their mission has changed, so should their acronym: SETL, the Search for Extra-Terrestrial Life. Or SET: the Search for Extra-Terrestrial whatever. Or SE: the Search for Extra whatever. Or just S: Search. You don’t need radio telescopes for that. Google is free – and you’ll find lots of aliens.